Professional design services could be required at many different points over the course of a Centre’s growth and development. For further description see Stages of Design. Typically it will be necessary to hire a local architectural firm to guide the Centre through any review or permitting processes required by the Planning Department, Building Department or other government authorities having jurisdiction over the project. 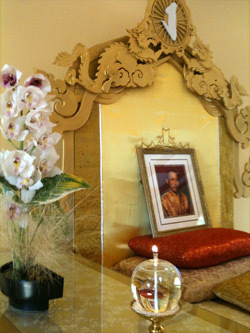 That firm may also be capable of coordinating the entire project, and offering excellent design services, but it is worth considering whether they will have the best understanding of the Guiding Principles involved in creating a building or environment that expresses our unique Shambhala culture. With that in mind, the Panel encourages hiring Shambhala professionals as part of the Design Team, and can make recommendations in that regard. It is also the policy of the Panel that its own members may be hired as part of a Centre’s Design Team. By way of clarifying a Panel Member’s roles and responsibilities on any Project where that person is hired as a member of a Centre’s Design Team, the Advisory Panel offers the following guidelines and recommended procedures. That the roles and responsibilities of that person(s), as a hired member of a Centre’s Design Team, be confirmed and clarified by way of signed contracts with said Centre, prior to proceeding with any work on the Project. That the person(s) at that point, recuse themselves as Advisory Panel Member(s), from participation in any formal or informal reviews of, or written and verbal comments on, the Project by the Advisory Panel. That there be a shared understanding between the Centre and the Advisory Panel, that said person(s), as standing Member(s) of the Advisory Panel, will continue in every other way, to represent the experience, understanding and point of view that they have cultivated and developed while being a Panel Member, but that their creative insights, design recommendations, and general input on the Project will not necessarily reflect the views or opinions of the Panel as a whole. That there be a shared understanding between the Centre and the Advisory Panel, that at the Centre’s discretion, said person(s) be in no way limited, as a hired member of the Centre’s Design Team, to participate in any formal or informal reviews of, or in any written or verbal communications about, the Project with the Advisory Panel. That there be a shared understanding between the Centre and the Advisory Panel, that these guidelines and procedures are merely an attempt to clarify confusion, while not limiting creativity and insights from all parties; that as such they do not represent a fixed, final, or complete list of helpful possibilities; and that they can be modified and adjusted to a particular Project at any time, upon agreement between the Advisory Panel and the Centre. For questions or suggestions, please contact Stephen Vosper, chair of the Panel.